VANCOUVER, Feb. 12, 2019 /CNW/ - InMed Pharmaceuticals Inc. ("InMed" or the "Company") (TSX:IN; OTCQX:IMLFF), a fully integrated, cannabinoid-based biopharmaceutical company that leverages its proprietary platform technologies to develop novel therapeutics for the treatment of diseases with high unmet medical needs, today reported financial results for the three and six months ended December 31, 2018, which is the Company's second quarter of fiscal year 2019 ("2Q19"). "During 2Q19, we also continued to make steady progress with regard to our biosynthesis platform technology," commented Mr. Adams. "We initiated the technology transfer activities from the University of British Columbia ("UBC") to the National Research Council Canada ("NRC") to support scale-up activities in late 2018. The first part of this process is the transfer of the protocols for high-performance liquid chromatography which has recently been completed. The second portion of tech transfer process relates to the transfer of the gene construct containing the coding sequence for the enzymes responsible for cannabinoid production. We will initiate this portion of the tech transfer later this month. After this second portion of the tech transfer is completed, we will initiate parameter optimization for fermentation scale-up activities at NRC." For 2Q19, the Company recorded a comprehensive net loss of $2.65 million, or $0.02 per share, compared with a comprehensive net loss of $1.54 million, or $0.01 per share, for the three months ended December 31, 2017 ("2Q18"). The primary reason for the increase in the comprehensive net loss in 2Q19 compared to 2Q18 was an increase in non-cash, share-based payments, in connection with the grant of stock options, which was $1.02 million for 2Q19, compared with $0.36 million for 2Q18, with the increase attributable to stock options granted during the second half of fiscal 2018. The Company's full financial statements and related MD&A for the three and six months ended December 31, 2018 will be available at www.sedar.com and on the Company's website at https://investors.inmedpharma.com/ on February 12, 2019. About Epidermolysis Bullosa (EB). EB is a group of rare diseases that cause fragile, blistering skin. The blisters may appear in response to minor injury, even from heat, rubbing, scratching or adhesive tape. In severe cases, the blisters may occur inside the body, such as the lining of the mouth or the stomach. Most types of epidermolysis bullosa are inherited. The condition usually presents in infancy or early childhood. Epidermolysis bullosa has no cure. About INM-750. INM-750 is a proprietary, topical cannabinoid product candidate targeted as a therapy in epidermolysis bullosa (EB) and other potential dermatological and wound-healing applications. It has been specifically designed with the intent to: (i) modify the underlying cause of the disease in certain patients with EB Simplex (EBS, the most common form of EB), and (ii) to treat the major symptoms of the disease in all patients with EB. Preclinical data generated previously demonstrates that INM-750 may have a significant impact on certain symptoms of EB (which may include improvement of wound area to promote healing, reduction in pain, itch and inflammation, and providing antimicrobial activity). These disease hallmarks are key therapeutic targets for the effective treatment of EB as well as several other dermatological conditions. Additionally, our data indicate that INM-750 may have an impact on the underlying disease by increasing the production of certain proteins, called keratins, in the skin. This news release contains "forward-looking information" and "forward-looking statements" (collectively, "forward-looking information") within the meaning of applicable securities laws. Forward-looking information is based on management's current expectations and beliefs and is subject to a number of risks and uncertainties that could cause actual results to differ materially from those described in the forward-looking statements. Forward-looking information in this news release includes statements about: developing novel therapies for the treatment of important diseases with high unmet medical needs; final selection of the contract manufacturing organizations that will provide the process and analytical development and GMP production of the topical cream for our first-in-human trial by the end of this month; between now and early summer, working on the GMP supply of the active pharmaceutical ingredients to be used in the Phase I clinical trial; during the balance of 2019, initiating stability studies and other regulatory enabling studies, which will lead into Phase I trial; a CTA submission to Health Canada in the second half of calendar 2019, and the beginning of the Phase I trial by the end of calendar 2019; the anticipated clinical dose of INM-750; the structure of the Phase I trial; the technology transfer activities from UBC to the NRC, followed by parameter optimization for fermentation scale-up activities at NRC; optimizing cannabinoid overproduction during the course of our ongoing work with UBC, likely leading to additional patents and other intellectual property; filing additional provisional patents in the 2Q of calendar 2019 and materially strengthening protection of our biosynthesis technology; developing and optimizing the down-stream purification process with our CDMO over the next several months; the potential of INM-750 as a therapy in EB and for other potential dermatological and wound-healing applications; and the expected fundamental value drivers of the Company. 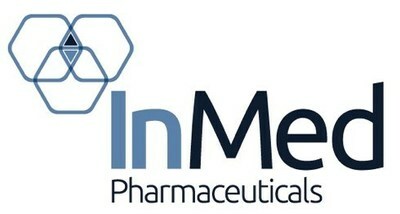 With respect to the forward-looking information contained in this news release, InMed has made numerous assumptions regarding, among other things: continued and timely positive preclinical and clinical efficacy data; the speed of regulatory approvals; the ability to contract with suitable partners; demand for InMed's products; and continued economic and market stability. While InMed considers these assumptions to be reasonable, these assumptions are inherently subject to significant business, economic, competitive, market and social uncertainties and contingencies. Additionally, there are known and unknown risk factors which could cause InMed's actual results, performance or achievements to be materially different from any future results, performance or achievements expressed or implied by the forward-looking information contained herein. Known risk factors include, among others: preclinical and clinical testing may not produce the desired results on a timely basis, or at all; regulatory applications may not be approved on a timely basis, or at all; suitable partners may not be located; economic or market conditions may worsen; and InMed's proprietary bioinformatics platform, biosynthesis manufacturing process and drug development programs may not deliver the expected level of results nor become the fundamental value drivers of the Company. A more complete discussion of the risks and uncertainties facing InMed is disclosed in InMed's most recent Annual Information Form and other continuous disclosure filed with Canadian securities regulatory authorities on SEDAR at www.sedar.com.